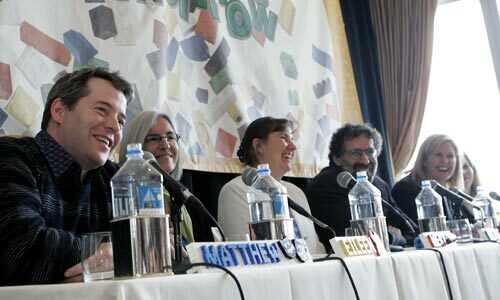 I was asked to build 20 LEGO models for use at an April 5, 2006 press conference in New York City, where six celebrity panelists spoke about why LEGO was important to them as a child, and why it is important to their children. - a video podcast of the panelists speaking. 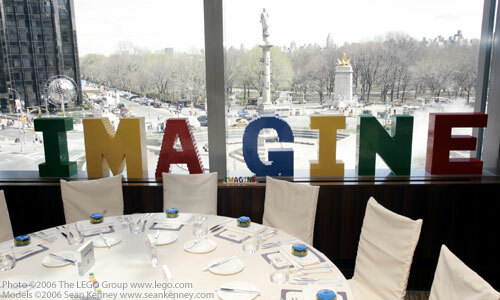 Held at Cafe Gray in New York, the theme of the event was "IMAGINE!"... 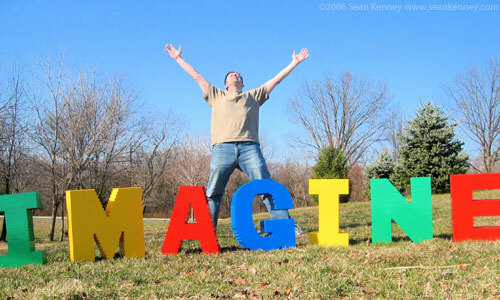 so I built the word "Imagine" in two-foot tall letters. Originally, each letter was going to be used as a table centerpiece... but with only 5 tables, they were relocated to the windowsill, with an amazing view of Columbus Circle and Central Park as a backdrop. Each giant letter used between 3000 and 5000 LEGO bricks... the whole word used over 23,000 LEGO bricks. 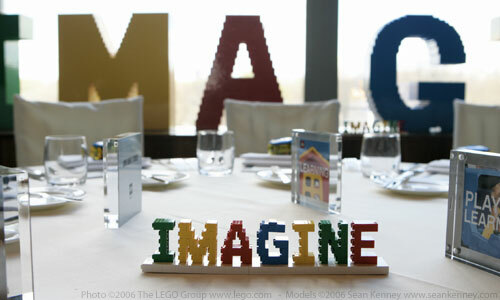 I also built seven matching mini models of the word "IMAGINE", each only 8 inches long. The original idea was, with a giant letter on each table, the mini words would tie the giant letter centerpiece back to the word. 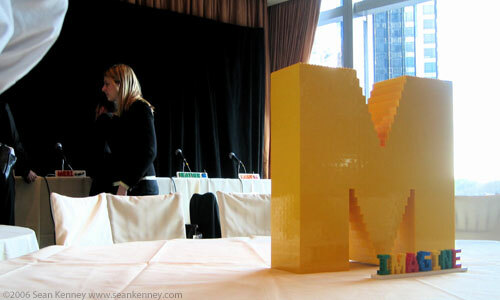 (So that people didn't wonder why there was a giant "M" on their table.) :) But after the giant letters were relocated to the side of the room, the miniature words acted as small centerpieces on their own. You can see from the photos that the letters are sideways... Because letters are generally defined by vertical lines than horizontal lines, turning LEGO bricks sideways means you can use the thin LEGO plates to create more detail than you could with upright LEGO bricks. Sadly, I wasn't able to stay for the event (or to meet the celebrities.) :) I was told, though, that they all loved their nameplates and each took them home!